Service Support Signpost PowerPoint Templates And PowerPoint Themes 1012-Visually support your Microsoft office PPT Presentation with our above template illustrating a service support signboard. Using signposts is intuitive and effective. Add impact to your next presentation with this high quality service support signpost template. Our stunning image makes your presentations simpler and professional showing that you care about even the smallest details.-Service Support Signpost PowerPoint Templates And PowerPoint Themes 1012-This PowerPoint template can be used for presentations relating to-"Road sign arrow to service, business, arrows, communication, marketing, signs" Festoon your address with our Service Support Signpost PowerPoint Templates And PowerPoint Themes 1012. You will come up with a festival of ideas. 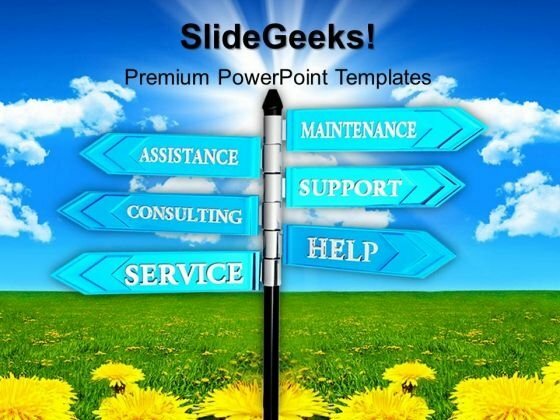 Launch your campaign with our Service Support Signpost PowerPoint Templates And PowerPoint Themes 1012. Make sure your presentation gets the attention it deserves.